When Nate Robinson wasn't running into crushing screens set by Jeff Foster, he was making his man crush with Will Ferrell very public, gifts included. "If that was football I would have returned it for six," Robinson said, referring to his gridiron days at the University of Washington. "But I would have been flagged for celebrating." Robinson celebrated after just about every basket and twice slapped hands with Ferrell, who was seated courtside. Afterward, Robinson presented his favorite actor with the green Knicks jersey Robinson wore at last week's Slam Dunk contest. He even autographed it for him. "You guys have no idea," Robinson said. "I wanted to play well for the team and for the fans, but definitely for him." Awww....that's so sweet. Forget selling the jersey and perhaps giving the profits to charity, I want my favorite actor to place it at the bottom of his dresser! I am hard-pressed to find one Will Ferrell movie that is legitimately funny. You don't find Old School funny? 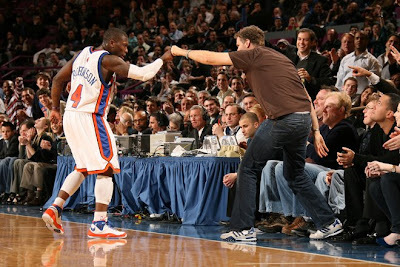 Ironically, Larry Hughes high-fived Dustin Diamond after all 200 of his bricks last night. Life-long love between a short black man and a tall white man at MSG and it's not Spike Lee and Chris Dudley? Oh this wasn't a caption contest, was it?